Created for people who desire to take a walk in the tiny streets of this ancient district, once inhabitated by fishermen and traders, to enjoy its historical and religious patrimony, for shopping, or to grant a restorative break in one of the many restaurants, among typical smells and tastes. It was built in fourteenth century by Catalans, in the area were existed the Pisan tower named Lapola (ancient name of the Marina district) and the medieval Church of S. Maria del Porto. The Church of Sant'Agostino was built around 1577 in Renaissance style, in Marina district; the main entrance is located in via Baylle but there is a secondary entrance that leads to Largo Carlo Felice. This Monumental Church rich in interesting art works was founded, according to some sources, by the Templars in the 13th century. Below the church is an impressive Crypt. 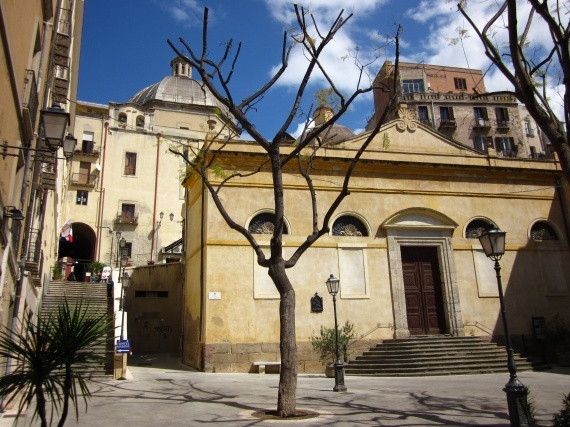 It is one of the monumental churches of Cagliari and it is located in Via Manno, in Marina district. The current building dates back to the eighteenth century and it is situated above a former structure. The church is located in a high area of Marina district, near piazza Costituzione. Dates from fifteenth century and was built as a vote to Santa Rosalia for the frequent plagues. The church contains the relics of San Salvador da Horta, for this reason is also known as the Church of San Salvatore.